Sunday afternoon, I wanted a cocktail. I needed a cocktail. It was that kind of day. That kind of weekend. Heck, it has been that kind of month. SP was busy starting a load of laundry, so I started grabbing bottles out of our booze cabinet. Limoncello, vodka, triple sec, peach schnappes. When he came back upstairs, he took one look, laughed, and starting measuring liquor into the cocktail shaker. 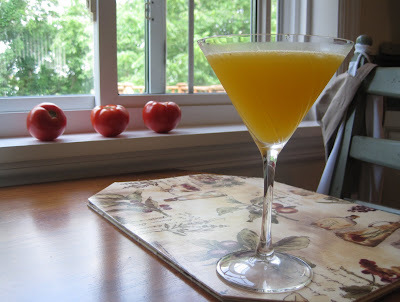 Moments later, I had an orange martini in a chilled martini glass (I put the glass in the refrigerator for a bit). Then we set about making dinner. It was a nice day and we were excited to grill and then to dine out on the deck. 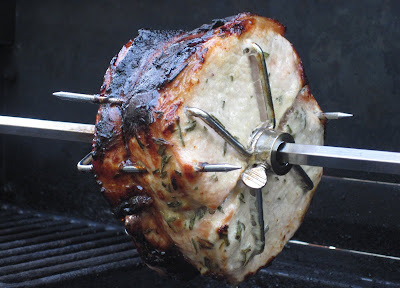 We made Honey, Mustard, and Rosemary Pork Roast (Bon Appetit July 1994) which we cooked on the grill rotisserie. We made Creamy Thyme Potato Gratin (inside, in the oven, not outside on the grill): And we made a salad with homemade balsamic dressing: We marinated our pork roast for 7-8 hours in a marinade of beer, Dijon mustard, honey, olive oil, and fresh rosemary (omitted the garlic, of course) and then grilled (rotisseried) it for about an hour. The marinade is saved, poured into a saucepan, some cream is added (we used milk) and then it is boiled and reduced to a sauce. 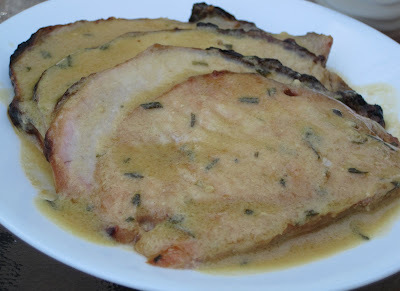 The pork and sauce were tasty, but not tasty enough to make me really, really want to make this again because we have other pork recipes that I like a lot more than this one. But it was definitely worth trying, especially since I really like the taste of honey & mustard. 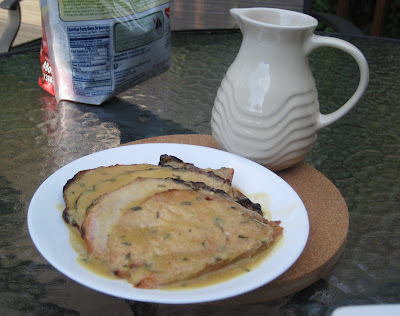 It was a nice change from the marinades to which we usually turn for pork. 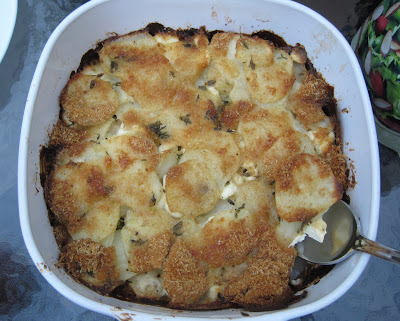 These potatoes are so good, but we only make them maybe once a year. 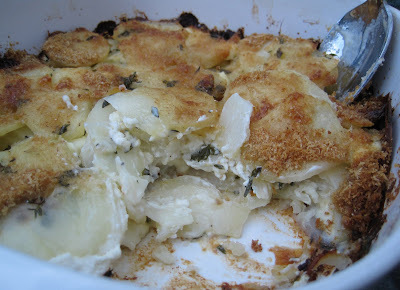 Butter, cream cheese, whipping cream - not exactly healthy foods! This time the potatoes were yummy, but not quite as yummy as usual, and I'm not sure why. They didn't seem quite as creamy. They were much tastier when reheated the next day. 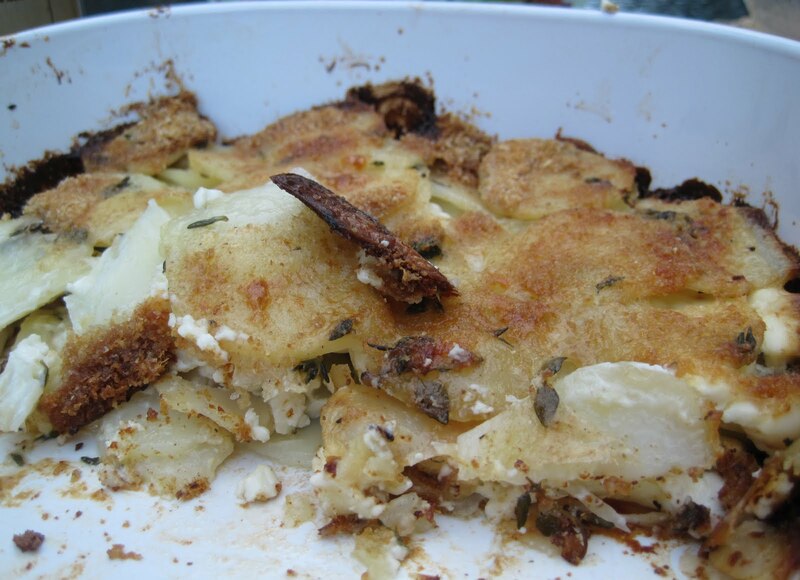 Even if these weren't quite up to par, they're still one of our favorite potato dishes, especially with fresh thyme this time (instead of our usual dried thyme). The salad was quite tasty. We used part of the lettuce head from the CSA, added chopped tomatoes and cucumber from Simmons Farm, and tossed in some goat cheese from the CSA. 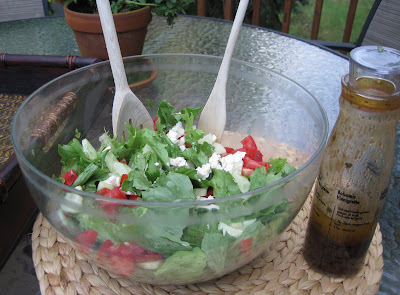 We made a balsamic dressing and instead of dried basil we used fresh basil in the dressing. It was a really tasty salad. I felt very 'local' when I ate it!!! All the ingredients were from the CSA/Simmons Farm. The best part of the meal was hanging out on the deck until the sun set. It was a lovely, cool evening, and so nice to be enjoying good food. I always feel so wonderfully secluded when we're out on the deck since it's surrounded by trees and I enjoy smelling our herbs and flowers. Plus, sometimes, we'll get a visit from Otis the Groundhog. Not on the deck, but below on the grass, and we peer over the railing at him as he munches his way across our yard and the neighbor's yard. I'm not sure how we'd react if he ever started climbing the stairs to visit us! But the chances of that happening are pretty slim. Usually if he hears us move or whisper, he darts back down the hill.